We hope to welcome you soon at one of our 38 restaurants for the finest Chinese cuisine in a warm and welcoming setting. If you need any assistance, such as directions or help making a reservations, please contact us using the phone numbers listed below or through our contact form. You can also contact us via email with your questions. Guests dining at Ginza Aster will receive a discount on parking fees for all spaces contracted by Ginza Aster. This discount is commensurate with the cost of the meal. For example, guests whose bill is more than 3,000 yen will received a discount of 1,000 yen off the cost of parking. Browse locations by prefecture: Tokyo, Kanagawa, Chiba, Saitama, Aichi and Osaka. The Ginza Aster main restaurant has endured for 90 years, having opened in 1926. The Chinese works of art in the interior create a refined and elegant atmosphere, and the flavors refined by Ginza customers earned this restaurant certification by the Beijing Global Chinese Cuisine Association in 2008 as a “well-known international Chinese food restaurant.” The head chef has gained experience all over China, and entertains customers with innovative cooking based in tradition. Since it opened in 1964, the Ginza Minami Restaurant has had many fans as a hidden yet well-known store. Although it's located in the heart of Ginza, once you step inside the door, you're met with a comfortable atmosphere separated from the hustle and bustle of the streets, where you can enjoy dining at your leisure. The old Matsuya Ginza Restaurant has 60 years of good history, and has been favored by customers along with the main restaurant for a long time. The casual sofa seating has a basic theme of white and can accommodate a gathering of up to 30 people. In this atmosphere, you can enjoy Chinese cuisine at your leisure. Banquet: 11:30 a.m. to 10 p.m.
Belle Chine Takeshiba lies at the very top of the New Pier Takeshiba North Tower that stands tall at Takeshiba Pier. This incredible location offers a panoramic view of the scenery around Tokyo Bay, including the ships sailing in and out of Tokyo Bay, the Rainbow Bridge, the Tokyo Sky Tree, and more. The large banquet hall can accommodate a maximum of 220 people. Please don’t hesitate to use it for restaurant weddings, splendid parties, or company events. Ochanomizu Guest House is a restaurant, along with the main store, that represents Ginza Aster. You can enjoy the view from the 21st floor of the Shin-Ochanomizu building on the elevation of Kanda-Surugadai in front of Ochanomizu Station. At dinnertime, brilliant illuminations spread over the panoramic view, and you can view Tokyo Sky Tree. It's ideal for a broad number of occasions, such as important discussions, all sorts of parties, family meals, wedding receptions, memorial services, etc. The Ginza Aster spirit has been added to traditional cooking from all over China, with a menu of 128 items so you can enjoy many dishes in small portions. The relaxed interior can accommodate a maximum of 100 people with its banquet room ideal for parties and banquets, and its bright dining space looks out on Meiji-dori. Opened in February 2007. Enjoy an Oriental dining experience replete with Chinese furnishings while looking down on Koshu Kaido, Shinjuku Gyoen and the Shinjuku subcenter nightscape. The 10 half-private rooms are perfect for dining with family or friends. The round table private room can accommodate up to 24 people and can be used for a broad variety of functions, including entertaining, meetings, welcome and farewell parties, etc. The classical European interior employs Chinese furnishings to create a relaxed atmosphere. It's ideal for dining before or after shopping at the Isetan Department Store, or when returning from work. Enjoy authentic Chinese cuisine made with carefully selected ingredients such as Kagoshima Berkshire pig, Daisendori chicken, etc. Opened in 2015, this location is a one-minute walk from the JR Kichijoji Station Atre east building exit, beside the Kichijoji Library. In a relaxed interior with a dark brown color scheme, enjoy orthodox Ginza Aster cooking. The main floor is on B1, and the second floor holds the banquet room. The name “Yusai” combines the characters “play” and “color,” conveying the restaurant’s desire to "let the heart play and be filled with color. This delicious cuisine soothes the heart and fills the body with healthiness from its core." It also has small private rooms. Please visit when returning from shopping and for all sorts of dining occasions. Belle Chine Machida is a little Chinese restaurant that chiefly offers popular noodles, rice and dim sum from the regular Ginza Aster menu. Please enjoy the flavors of Ginza at ease. Located directly by Shibuya Station, this useful location allows you to drop in even when shopping alone or returning from work. With its selection of noodles, dim sum and lunch sets made with a variety of seasonal ingredients, you can also enjoy delicious food at this restaurant when you are short on time. Opened in 1981 with the concept of “the flavors of Ginza in Setagaya and Sangenjaya.” It offers a special experience with its relaxed entrance, casual seating showered with light, and calm banquet hall. With the concept, “savor everyday high quality more simply,” Belle Chine Ikebukuro is a newly presented department store restaurant that has the authentic knowledge of an older shop. In addition to a full array of popular noodles, rice, etc., Belle Chine Ikebukuro also offers original dishes. Akabane Guest House offers a bright, relaxed interior in which to enjoy a meal, and is located only a 3-minute walk from Akabane Station. The entire interior layout is comfortable, and in this coziness lies its charm. In addition to a view of Arakawa, it's also equipped with a private banquet room. Belle Chine Omori is located on the second floor of the Omori Bellport B Building, which has the largest atrium in Japan. The seating is ideal for welcoming guests, and the restaurant has a quiet and dignified bearing. The half private rooms are perfect for business discussions and entertaining important people, and the 5 private rooms are available for a variety of purposes. At Kamata Guest House, you can enjoy a leisurely meal in luxurious comfort. It's conveniently located directed by the JR Kamata Station. At the back of the restaurant is a party space that can accommodate gatherings of up to 90 people, and there are all varieties of private rooms. Since it first opened, Senju Guest House has been supported by local customers. It has a bright atmosphere, and provides for customers of all kinds with everything from small private rooms ideal for family chitchat or important business discussions, to a large banquet hall that can accommodate parties of 150 people. It's a perfect communication spot for all locals. Petit Chine Machida is a little Chinese restaurant that specializes in healthy menus with a variety of vegetables as well as popular noodles, rice and dim sum from the regular Ginza Aster menu. Please enjoy the flavors of Ginza at ease. The Kanamachi Restaurant has continued to do business since 1968, and is intimately connected with the local people of the Katsushika Ward. The restaurant has a private banquet hall that can accommodate up to 30 people. It can be used for family gatherings like children’s birthdays, coming-of-age ceremonies, memorial services, etc. Newly opened in January 2018. Surrounded by greenery, our newest restaurant is just a 1-minute walk from Meguro station. The restaurant has more than 100 seats and 9 private rooms in sunny, South-facing dining spaces. Since it opened in front of Fujisawa Station in 1971, it's been favored by many customers as a famous Shonan restaurant. The small and large private rooms can accommodate banquets of up to 150 people, making them ideal for local social interactions. Located in the representative tourist location of the Greater Tokyo Area, elegance and calm are characteristic of “Kamata Guest House.” It's located in the Enoden Building adjacent to Kamakura Station, and serves as an important place of hospitality for local people who need a resting place. There is a delicatessen in the same building. The Sogo Yokohama Restaurant is in the Dining Park Yokohama well-known restaurant and longstanding stop zone. “Belle Chine” is associated with the name “beautiful China,” and the restaurant boasts of a variegated menu that uses carefully selected ingredients that are delicious and healthy. The Chinese furnishings decorating the entire dining area create a relaxed atmosphere. The private rooms can also accommodate gatherings of 30 people. From the 11th floor at the very top of Morisia, you can enjoy a beautiful view at day or night. It offers casual dining for a small number of people and relaxed formal rooms perfect for dinner meetings, as well as half-private rooms perfect for important business meetings. The small and large private rooms can flexibly accommodate various group sizes. The restaurant name “shikisai” contains the desire to convey Japan’s four seasons with Chinese cuisine, and present dishes made with authentic Chinese techniques that incorporate the aromas and umami of seasonal Japanese ingredients. Starting with the window seats that overlook the rooftop garden, the floor is filled with natural trees and overflows with soft light, providing a relaxing atmosphere. This is the only Ginza Aster stand-alone restaurant. It's conveniently located, as the surrounding area has shopping facilities; cultural facilities like a library and science museum; and sports facilities like a tennis court, golf course and pool. Beneath the high ceiling of this restaurant, you can enjoy the changing of the four seasons through large windows. Located on the 11th floor of the Kashiwa Takashimaya Station Mall Guest House (Annex) directly connected to Kashiwa Station. The dining area faces windows that look down on the bustling station, and far in the distance Mount Tsukuba can be seen, creating an expansive atmosphere. The 6 private rooms are flexible and can accommodate everything from small group dinners to 60-person parties. The Isetan Matsudo Restaurant is lively with all sorts of customers: families, couples, close friends, etc. There is a convenient delicatessen in the basement first floor of the department store. The banquet area accommodates up to 70 people and offers a luxurious moment in time. Kawaguchi Guest House lies in the local community location of the Kawaguchi Sogo Bunka Center. The 13th floor has tables with a good view, and the 14th floor is a banquet hall. Daytime offers an expansive view of the flowing Arakawa River, while at night you can enjoy a special moment in time gazing out at the enchanting city lights. Since it opened in 1962, Urawa Guest House has been beloved by local customers. The first floor has a bright modern interior with tables and chairs, while the second floor has small and large banquet areas. The entrance includes a small delicatessen shop that offers popular side dishes. Omiya Guest House is at the east exit of Omiya Station. The interior overflows with high-class atmosphere, and you can feel familial warmth from the staff who provide so many customers the utmost satisfaction. It's designed to accommodate the various needs of all local customers, with half private rooms as well as independent Western-style rooms. The restaurant name “shikisai” contains the desire to convey Japan’s four seasons with Chinese cuisine, and present dishes made with authentic Chinese techniques that incorporate the aromas and umami of seasonal Japanese ingredients. The entrance is decorated with natural stones based on the theme, “the combination of food and earth,” and the sweeping view of the Omiya streets gives this floor a sense of freedom. The Kawagoe Maruhiro Restaurant is popular as a place where people can locally enjoy the flavors of Ginza. The staff offer friendly service unique to the local area, bringing smiles to many customers. Since there is seating at a large counter in the center of the floor, it's also perfect for dining by yourself. Nagoya Guest House is known as a sky restaurant. You can enjoy a beautiful view of the Sakae streets, including the TV tower. Of course it's wonderful for dinner among close friends, as well as for couples. There is also a large banquet area that can accommodate up to 200 people, as well as stately Japanese-style rooms. The Nagoya Matsuzakaya Restaurant is in the Matsuzakaya Nagoya Kitakan (North Building) Basement restaurant area. There is a party space for modern dining that can accommodate up to 60 people. Enjoy noodle dishes made daily with an in-house noodle machine. Located in the “Gourmet Station” on the 9th floor of the Meitetsu Department Store Main Building directly connected with Nagoya Station. This location is perfect when you're returning from shopping or work. 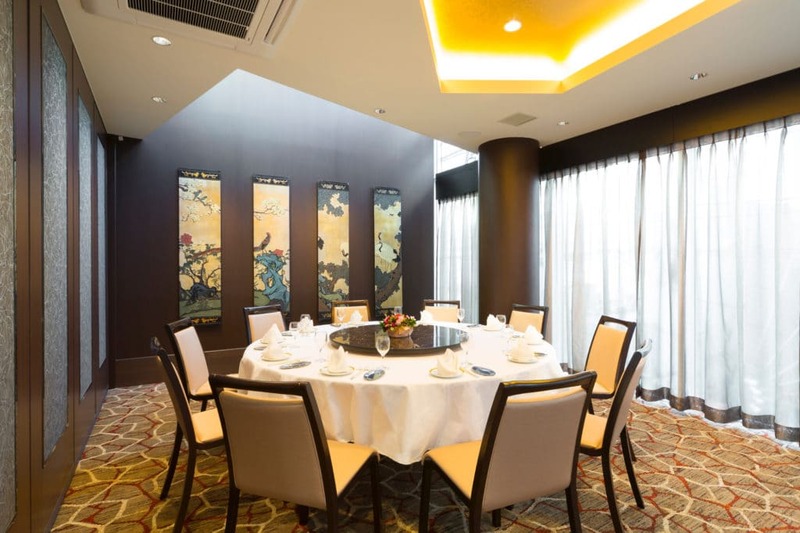 There is a modern dining area with white and red Chinese objet d’art, as well as an adjacent banquet room, etc. This restaurant is distinguished by its view, which is superb even for its location in the Hankyu Umeda Main Store restaurant area. You can look out over the streets of Osaka from the seats facing the windows. The famous local iron plate cooking piles ingredients onto a hot iron plate and serves dishes piping hot. You simply must savor the dynamic “new Ginza Aster dishes” that can be enjoyed with all five senses and overflow with a sense of presence. Uehommachi Kintetsu Guest House is located on the 12th floor of the Kintetsu Department Store Uehommachi. The restaurant interior has an atmosphere beyond the refinement one might expect from its department store location, where you can quietly enjoy your meal. The half private rooms are also perfect for meetings, etc.